On 24 August AD79, the sleeping giant Mount Vesuvius erupted with horrifying force, destroying the prosperous Roman cities Pompeii and Herculeneum. Their inhabitants were subjected to 24 hours of untold horror. Four million tonnes of pumice, rock and ash rained on the towns, suffocating the life out of the cities, and burying alove those who had been unable to flee. Pompeii - The Last Day recreates that momentous day, and shows first hand the horror of Pompeii's last hours. Factual characters based on historical and forensic evidence unearthed in Pompeii and Herculaneum, as well as extracts from Gauis Plinius Monor's account of the disaster, help bring to life one of the most notorious disasters in history. 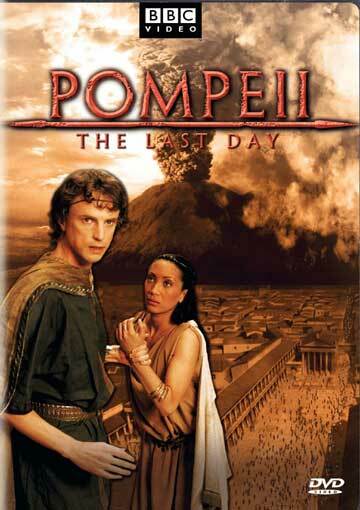 Using stunning visual effects, the film recreates each stage of the 24 hour eruption and explores the devastating impact on the main characters; Julius Polybius, wealthy baker and aspiring politician; Stephanus, a cloth worker and social climber and his wife Fortunata Celadus the celebrity gladiator; Pliny the elder, in charge of the rescue mission; and, finally, Pliny the younger, who documents the horrors of the tragedy. The highest ever rated history documentary on the BBC at the time of its release in 2003, it was reportedly watched by more than 10 million people. English subtitles for this release are available here. Romanian subtitles for this release are avialable here. Dutch subtitles for this release are available here. This page was last modified 14:11, 8 March 2019. This page has been accessed 14,597 times.